Pesticide Complete Production Line_Anhui Bunkin Chemical Machinery Co.,LTD. Application: Suitable for organic pesticide, inorganic pesticide, botanical pesticide, microbial pesticide, etc. Complete production line designed for organic pesticide, inorganic pesticide, botanical pesticide, microbial pesticide. 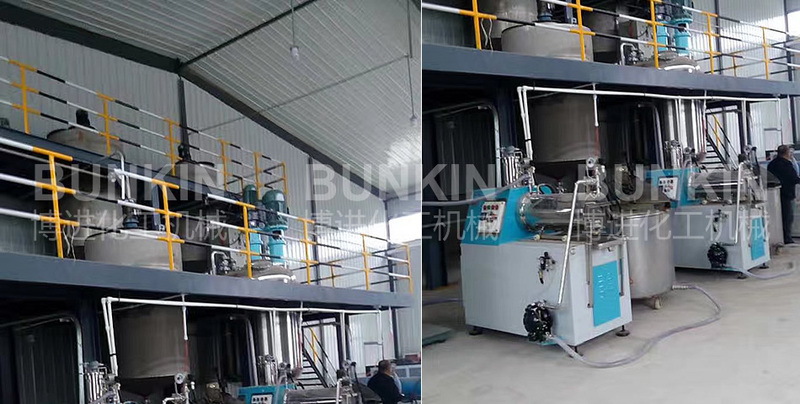 Bunkin provides design and manufacturing of pesticide complete production line adopts raw materials automatic charging, metering system, dispersing &emulsifying and mixing system, milling system, cleaning system, automatic control system, automatic filling machine, etc advanced manufacturing method to realize automatic production. The Complete automatic production process reduces workloads and avoids quality problems caused by human factors and herein, improves the products quality and efficiency to large extent. Materials:Liquid pesticide, suspension pesticide, emulsion pesticide, etc. Application:Suitable for organic pesticide, inorganic pesticide, botanical pesticide, microbial pesticide, etc. pesticide production process contains following steps: batching, dispersing, milling, mixing, filtering and filling. Batching and transmission: liquid batching adopts pumps, flow meter, powder batching adopts weighing system and air transmission, additive batching uses weighing method. Milling: A further process stage. Basket mill and horizontal beads mill are optional according to product requirements. Mixing: Part of additive are added into liquid and mixed to store finished products and protect materials deposition or stratification. Filtering: impurities are removed with the help of bag type filter or self-cleaning filters. Filling: filtered product are filled whose specification is normally 1-5kg and 10-25kg. Semi-auto or automatic filling machine are optional. Dispersing kettle adopts multi-shaft and multi-function design with low speed scraper mixing &dispersing and high shear emulsifying device. 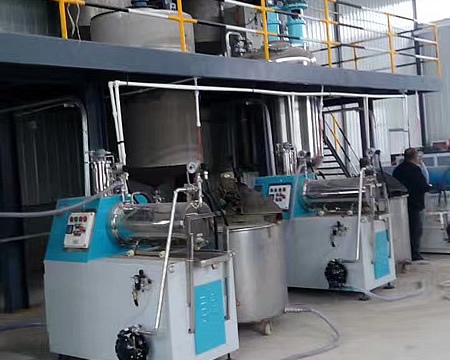 Different mixing devices can be used together or separated in different stages to mixing powder and additives into liquid in short time to get good product. Basket mill, horizontal beads mill, etc high fineness milling machine are applied in production lines according to production process and products characteristics(materials fineness) to mill and thin raw materials. Ground materials show good products with good fineness, high stability, small chromatism and less pollution. Products are manufactured in totally closed flow line production surroundings, there is no dust in workshop which reduces operators�� workload and improves efficiency to large extent. Powder and liquid storage and batching system, automatic filling system, PLC control system are optional according to process to realize the automatic produce and remote control. Dispersing device: single-shaft dispersing kettle dual-shaft dispersing kettle, multi-function dispersing kettle. Milling device: basket mill . Horizontal bead mill. Filling: semi-auto filling machine, automatic filling machine.